आम्हाला हे सांगण्यास अतिशय आनंद कि भारातला लागोपाठ चौथ्या वर्षी, एस्टोनिया येथे झलेल्या, २३व्या आंतरराष्ट्रीय फिलोसोफी ऑलिम्पियाड (आय.पि.ओ.) मध्ये, रौप्य पदक मिळाले आहे. गेले ८ वर्ष भारत या आंतरराष्ट्रीय शाळेय स्पर्धेत सहभागी होत आहे. दर वर्षी वेगवेगळ्या देशात होणार्या या स्पर्धेत भारतातून एक शिक्षक व दोन विद्यार्थी सहभागी होत असतात. हे विद्यार्थी बहुतौंशी ११वि-१२वि चे असतात व देशातील निरनिराळ्या भागातून आलेले असतात. या विद्यार्थ्यांची निवड एका ओन-लाईन स्पर्धेतून केली जाते. ईन्दिअन फिलोसोफी ऑलिम्पियाड नावाच्या ह्या स्पर्धेचे संचालन डोंबिवली येथील अभिनव विद्यालयाचे विश्वस्थ श्री. केदार सोनी ह्यांचा नेतृत्वाखाली होत अस्ते. केदार सोनी आणि त्यांचे माजी विद्यार्थी (ज्यांनी पूर्वी ह्या स्पर्धेत भारताला मिळवून दिले आहे) पुढच्या विद्यार्थ्यांची निवड आणि त्यांचे ट्रेनिंग घेत असतात. त्यातील एक विद्यार्थिनी कु. पूजा बिलीमोग्गा हिने गेल्या वर्षी भारतातच्या टीम चे नेतृत्व देखील केले आहे. या उपक्रमाला अध्याप कोन्तातेही आर्थिक सहाय नसून टीम मेम्बर आपले खर्च स्वतः उचलतो. या आठ वर्शात भरतीय सङ्घने ४ सिल्व्हर, १ ब्रोञ्झ व २ होनरेब्ल मेन्शन पट्कव्ले आहेत. भारतीय युवकांना चिकित्सक आणि तर्कशुद्ध विचार करता यायला हवा कारण य्हातूनच भारताचा बौद्धिक विकास आणि अनुशंघाने आर्थिक विकास होईल या धोरणाने केदार सोनी यांनी हा उपक्रम हाती घेतला आहे. त्यामुळे जवळपासच्या अनेक शाळांचे विद्यार्थी अभिनवमध्ये तत्वज्ञान शिकण्याकरिता येत असतात. तसेच भारतातच्या अनेक भागातले विद्यार्थी त्यांच्याशी ओन-लाईन साधनान-द्वारे संपर्कात असतात. ट्रेनिंग ब्लोग व गुगल hangout च्या मध्यमतुन दिले जाते. ज्ञान प्रबोधिनितील आभिशेक डेढे (पुने, १२वि) व निहार कुल्कर्णि (नगर, ११वि) यांचि निवड सुमारे २५० विद्यार्थ्यांपैकि झालि होति। ३ महिने ओन-लाईन व २ अठव्डे प्रत्य्क्ष केम्प मध्ये रोज सतत्यने १२-१४ तास तयारि केलि होति। आभिशेकने फ़्रेगे नावाच्या जर्मन फिलोसोफेर्चे "विचार ह्याचे अकलन व संवेदन यापेक्शा वेग्ले अस्तित्व आस्ले पहिजे" असे म्हणनारे विधन घेत्ले होते। त्याने य्हावर "विचाराना वास्तविक्तेचि जोड नसल्यास त्यांचे अर्थपुर्ण अस्तित्व आसु शकत नाहि" अस वाद माण्ड्ला। या लेखाकरिता अभिशेक ला सिल्व्हर मेडल मिळाले. कौतुकाचि गोष्ट अशि की इतर पदक मिळवणार्या देशात फिलोसोफि २-३ वर्श शिकव्ला जातो जिथे अभिशेक हा सयन्स्चा विद्यार्थि आहे, व त्याने १२वि स्म्भाळुन हे यश मिळव्ले आहे। त्यने २०१४ मध्ये सुद्धा आय.पि.ओं.मध्ये रौप्य पदक जिंक्ले होते। त्याच्या या कामगिरि बद्द्ल त्याला रोचेस्टर, न्यू योर्क येथे कोग्नितिव्ह सायन्स मध्ये अद्मिशुन व स्कोलर्शिप देखिल मिळालि आहे. आय.पि.ओ. चे एक ध्येय हे पण आहे कि युवकानि वेग्वेग्ळ्या देशतील व निर्निरळ्या धर्म, भाषा व संस्क्रुतितिल युवकांशि मेल-जोल वाढ्वावा। अभिशेक आणि निहार ने एस्टोनिया मध्ये अनेक मित्र जुळव्ले व अनेक गोड आठ्वणि आप्ल्या बरोबर आण्ल्या. Hello Dear Students & Parents!!! Last three weeks have been very busy, beginning with the Abhinav Stars and running into the camp and the sports meet. The last activity for the year (only National Science Day scheduled in Feb if the exam timetables permit) is coming to a close. We have been holding the adventure sports each year for the last 25 years, with the last 15 years being done with professional help. Each student who has passed out of this school from std X or XII has (at least twice) did the variety of activities. The purpose of these events is simply - Make one extremely confident. Fear pulls you back from many things in life and the greatest fear is to hurt yourself or die. These activities make you realize that with a little science and technique one can achieve the impossible. Every one must do this at least once in their lifetime. We even encourage each of our teachers to do it. In fact even 50+ teachers have tried it for the first time in their lives at Abhinav. This year we are lowering the bar for entry, down to std III. Earlier it used to be only for the G3, but as the instruments to allow younger students to do it safely, have become available, viz., free-size, full body harnesses, we are taking this a step further. So, what are these adventure activities? ​The student is put on a harness so that there is one person holding the rope of the harness from above and releasing it as the student slides down. Also the rope on which the student is sliding down (secured to the harness) is held by two people (belay). If either the bottom belay person or the student chooses to tighten their grip on the rope, the student is locked in place. Thus with this 3-point safety, the student climbs down fro the second floor. This technique is used to climb down steep faces of mountains. Observe how the student is strapped to the rope which is string across the distance (on 28th it will be from second floor above the Offices down and across to the stage). There is a movement rope to which the students harness is tied. A rope around the harness is held by people on either side of the rope. Plus there is a safety rope above the main rope to which the student is tied to a pulley. Thus there is a 4-point safety here. This technique is used to travel between valleys or rivers. A bridge made of ropes is tied between two ends of the quadrangle on the first floor. You can see a rope tied across the student's waist to hold him. This is held by people at both ends, in case the student stumbles. The student has to hold the side ropes and walk on the bottom rope. This time, since we have young students we will tie them with a body harness instead of the waist rope (this is more secure). Also, we will have a net placed below them like in a circus, which will ensure more safety. This sort of rope bridges are regularly used by village people in the hilly areas, including small kids and old women. This is a standard fitness training for the armed forces and the police. One has to climb the net from ground to up (that's the easier route) This requires a bit of muscle control and the technique is to stay in the middle of the net. Hence this is perfectly safe. For younger kids we will employ a waist rope to hold them at the top (top belay) so that there is no risk. I don't have a picture here but its a simple rope bridge built on the ground floor, about 3-4 feet above the ground, between two pillars/trees. Student has to walk across the lower rope while holding the upper rope. For the younger students we will lower the ropes to be just a foot or two above ground. This is the simplest bridge to build in the outdoors across a valley or river. Our professional friends demonstrate the right posture and how to take aim. Adventure sports are not complete without a little practice on the gun. The reason why we hold these activities indoors is that it is difficult to transport the students outdoors, although the feel of doing this outdoors is always fantastic. Also, the younger students cannot bear the harsh sun and the weather outdoors for the long time that it takes to complete these things. What we ask of our students is to learn the techniques rather than do it as a fun-thing. Once you master the technique your confidence and skill grows. Students from std III onward up till college are allowed to participate in any of these activities. We are having requests from parents of std I and II for the same. In principle a kid above 4-5 years of age should be able to do this safely. However, our concern is time mgmt. As the professionals are here only for 1.5 days and I cannot allow various age groups to intermix. (for reasons of safety) I have hardly a slot left. The slots will be announced depending on the entries. So students of std III above, please make sure you have enrolled for these events before Thursday. If there is room I will take in students from std I & II. Parents are requested to visit the event, so that you realize how useful it will be in your child's development. I will try to make more coupons available on the day of the event, if entries are limited. We asked those students who had access to broadband internet or TV to view the telecast from home using any device. Those who could not were asked to wait in school and watch the show. 90% students chose to do it from home. Now to confirm that the students had watched it, we asked them to login to our Google Apps domain (using the abhinav.ac.in email accounts they already had) and give a small quiz at 5:15 pm on the same day. The quiz was created as the PM's chat unfolded and was uploaded just after the show. The questions were not merely factual, but also slightly twisted as to check the interpretation of the viewer. The quiz could be answered from any device capable of being on the internet at any speed. The quiz was time-bound and the paper expired after 1 hour. Barring a few cases of power-cuts leading to loss of connection or some students forgetting their passwords, things were done smoothly. Thus we used the opportunity in two ways - a) to test-run the online assignment system for a large number of classes simultaneously and b) to check the capacity of the students to interpret aural content. What is interesting is the results of the quiz. A quick analysis (credit: Google Analytics) and a short discussion is presented here. Readers are welcome to add to or suggest corrections to this discussion. A link to the analysis is here. Some interesting cases of answers are shown below. Q1. How would you describe the PM's oratory skills? Goes to show that most students could not think critically enough to judge the difference between being convincing via argument and being impressive. Q3. Which of the following is a primary according to the PM? Q5. Which of the following qualities, did the PM (directly) imply, that a teacher must have? Q8. What seems to be the PM's opinions on the issue of Climate Change? Students seem to be fed with certain notions so strongly that they simply cannot perceive new perspectives. The PM clearly initiated this point with an example demonstrating that climate change has been hyped up as a problem, while it really may not be so. Q10. What were his comments on skill based education? Another case where students could not do away with their deeply imbibed notions that degrees are "THE Thing" to have for a good life. The PM clearly implied that skills beyond the classroom are needed. Hence the answer should have been simply (a) and (c). Clearly ... there's a lot to be yet accomplished by teachers. This post is related to the report on the quiz based on PM's speech during teacher's day. I have republished the summary here after removing certain parts which could give away the students identity. Q2. According to the PM - how effective is experience as a teacher? Q4. When the PM narrated an experience regarding an invitation to speak somewhere, what did he comment about the nature of Man? Q6. What were his comments about mischief by a student / child? Q7. What seems to be the PM's opinions on the issue of Man and Nature? Q9. What are the PM's plans to change India (education-wise)? On the auspices of the UNESCO Philosophy Day (19th Nov), Finland organizes a Philosophy competition for countries around the baltic sea. 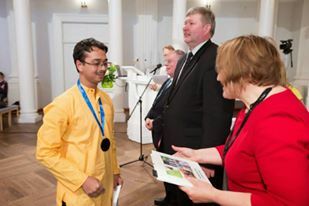 Since 2008, India also sent entries to this competition. Students are supposed to write an essay on 1 out of 4 topics given in a supervised span of 2 hours. The local organizer is then supposed to select 2 of the best essays and send them across to the Finnish organizers, who then go throug ha rigorous process of filtering the essays, quite similar to the International Philosophy Olympiad and declare the medals. Those who miss the medal by a very short difference are given an Honorable Mention. 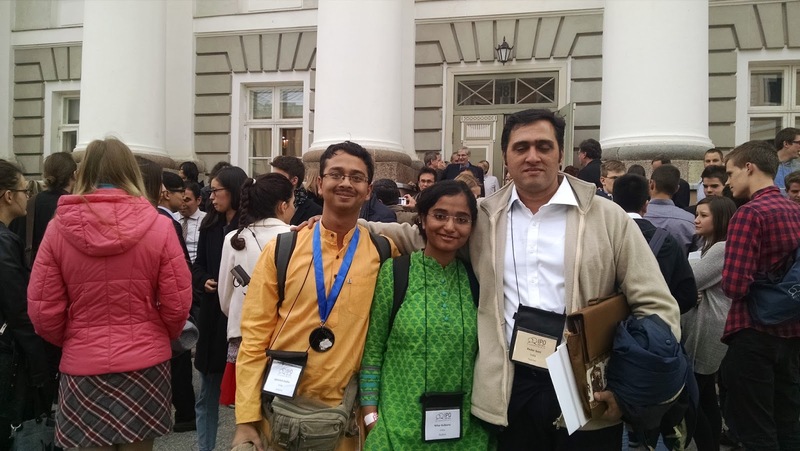 The result for this year has been good for India with Chitra Adkar (SYJC Ramnarain Ruia College, Matunga) getting Bronze and Prathamesh Kubal (SYJC, Abhinav Vidyalay & Jr. College, Dombivli) getting the Honorable Mention. Details will be shortly put up on the organizers web sites. We are testing the possibility of having online lectures & study sessions for an entire class or a small group of students, sitting at home or in the cyber cafe, using a PC with a speaker and a decent internet connection. the teacher uses instant messenger or chat rooms to voice communicate with the students at a pre-decided time and sometimes (for smaller groups) uses advanced web-conferencing tools. So far the trials have been partly successful. To get details of how to use these technologies, visit our web site. 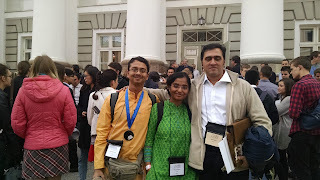 I am very happy to announce to the Abhinav family that two girls from our school represented India in the Int'l Philosophy Olympiad held at Iasi, Romania between 18th & 22nd May 2008 and that contrary to everyone's expectations, they performed exceedingly well. The overall result was that Vallari Sawant (XI, presently at St. Xavier's College) stood 14th missing the bronze medal by just 0.1 mark, and secured a Honorable Mention for her talent, while Chitra Adkar (X) secured a special award by ranking 23rd from amongst almost 60-odd students from about 24 countries. I must say that this is a incredible achievement for these girls since this is the first time India has participated in this Olympiad organized by the Federation of International Philosophical Societies which runs under the aegis of UNESCO. 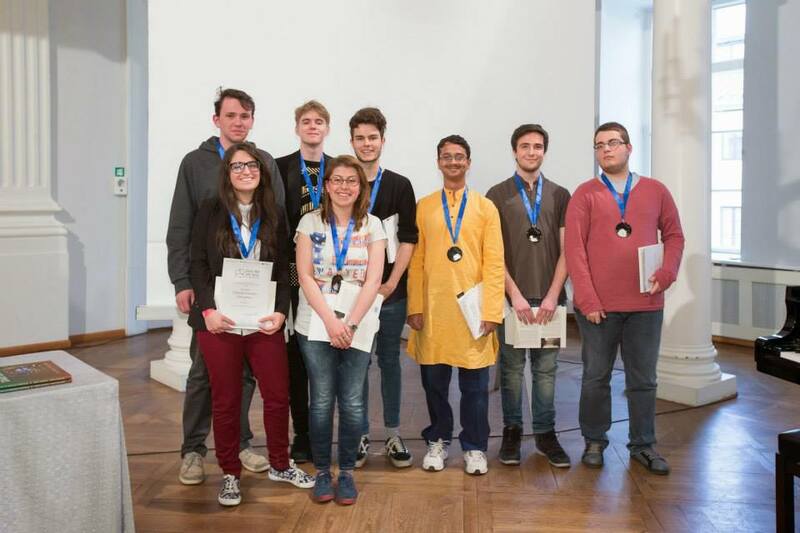 This was the 16th year of the Olympiad which primarily is a test of talent for high school students in the field of philosophy. What is more interesting is that the 4 hour essay that the students have to write on one the four given topics (quotes by different philosophers) is based entirely on European philosophy and thus our students had had no formal training in the subject. I had selected these students after circulating the information to some nearby schools and educators in the month of December. As it is the first time I was organizing this, it was not possible to include a larger group in the selection process. Then we had some long and some very long sessions (as all my students are used to) discussing various aspects in Ethics, Metaphysics, Aesthetics or Praxeology. Ultimately around March we began discussing the Philosophy of Science and the Philosophy of the Mind. The girls and I discussed quite a few essays and read a lot of books and papers/articles over this period. 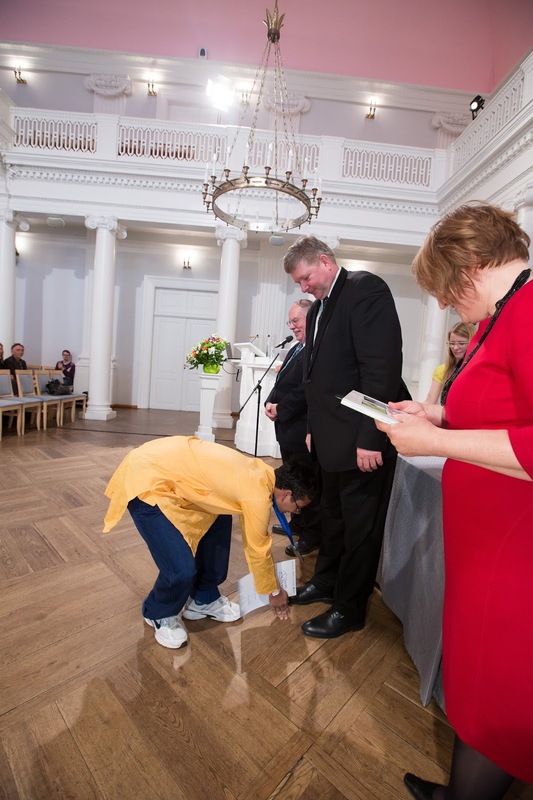 At the Essay round of the Olympiad, Vallari got a topic from her favorite area - "Is the Person identical with the Body?" - while Chitra got her favorite subject of Political ethics to do with Ludwig Von Mises's quote about Freedom and Tolerance. Our participation was quite unsure up to the last moment due to Visa hold-ups, but cooperation from the Romanian Ministry of Youth & Culture was of great help in this process. The journey was an adventure to all the three of us - the girls had many a thing to learn about the cultures and lifestyles, while I had quite a few insights into the way western philosophers thought, particularly as I am a layman to philosophy. (I used to tell everybody that since I am an Astronomer, my philosophy is out there) We all made some good friends and exchanged a lot of thoughts about our culture and theirs. Most of the countries being European, (except for Korea & Japan) they were very inquisitive about our culture and thoughts. The theme of this years event was "Philosophy: A space for inter-cultural dialog" and as such every country's delegation was very happy to receive the delegates from the land of a billion, the land of Swami Vivekananda and Gandhi and the land of the most ancient of philosophies. And now for the lighter side ... as is usual there were quite a few "inter-cultural" mishaps. On a tour to a nearby monastery we were shown some large bells on a tower and one of the group mimicked ringing the bell. Taking cue from this I actually gave a loud jolt to the largest bell there was and then there was a huge clang and then a huge silence ... all the monks, all the workers there were and all my group members were shocked and angered by this act. The only way i escaped the impending punishment was when I explained to them that in Indian temples, bells are meant to be rung to invoke the Deity and thus i only acted according to my culture. Another incident was during the opening ceremony when everybody was invited to dance the typical Romanian dance where everyone goes dancing around a circle while a couple comes forward and does some special steps for the duration of one chord. It happened to be my turn to perform something with my partner and not knowing "any" steps I simply broke into a Koli dance 'Aamir Khan isthyle' and all the people shocked at first eventually enjoyed. The similar thing happened when at the closing ceremony, some of the organizers started doing the same dance, some of the Greek students barged in and hijacked the floor transforming the Romanian steps into Zorba's dance - goes slow in the beginning and then rises to a very fast beat. This eventually was transformed into a Russian folk dance by one of the very talented Russian students and things went on from there. We actually lived "Multi-culturalism" for the seven days of the Olympiad. Please look-up the photos from the slide-show I have put up on Picassa. Thus apart from the DVD-players & the I-pods that the girls got as a prize, and of course the certificates showcasing their talent to discuss deep issues of philosophy, the girls also got a once-in-a-lifetime lesson about being a global citizen. That confidence that each of them gained and the awareness that freedom comes only with tolerance of the other persons ideas, was I think, equivalent to a Gold Medal. Pictures from the Abhinav Photographer competition during Stimulus 2007. Students of the final round were asked to photograph the given spacecraft paper-models in the best possible manner. In fact some of you could help me make a proper video out of the 30-odd min film I took at the NSD. This could be a good summer activity. To distract the staff from regular drudgery and allow them to try teaching new courses, so as to polish the skills they had learnt a while ago but never had a chance to use. So here's your chance to do something useful and interesting this summer. Hope to see you on Tuesday the 3rd of April to finalize enrollment. The Summer School begins on the 5th.